Age-old traditions heat up the tempo of urban life once a year at Carnival. But few realise the transplanted arts and crafts are not just for flesh and frolic… and masquerading ‘round the streets. Carnival is Black humanity on the frontlines of history. Therefore, Carnival has deeper meanings for everyone. 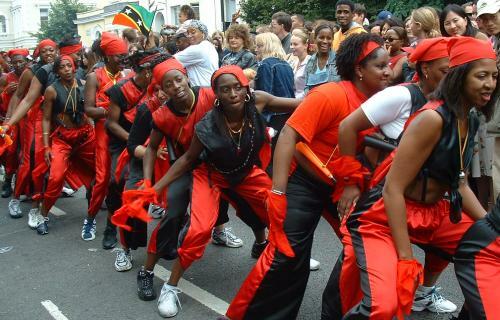 Afro-Caribbean migrants brought “We ‘ting” to Britain. Trinidadians birthed it. Civil rights activist Claudia Jones thrust their voices into the public realm. Pioneering Selwyn Baptiste educated children in culture using the steel band, says Alex Pascall, once chair of the Carnival Arts Committee 1984-1989. “Hammerblows on metal are acts of love but listen well for tones of rage and hurt”. – John Agard, Mangoes and Bullets. Selected New Poems 1972-1984. Serpents Tail, Pluto Press, London 1990. “The black people in the West Indies have produced all the culture we have, whether it is steel band or folk music. Black bourgeoisie and white people in the West Indies have produced nothing. Black people who have suffered all these years create. That is amazing.” – Walter Rodney, The Groundings with my Brothers. London: Bogle-L’Ouverture, 1969, p.67. “(In Trinidad) Carnival and calypso remained the preserve of the black working population (although Europeans and other races participate) until sanitised, given respectability and appropriated by the middle class”. – Amon Saba Saakana, The Colonial Legacy in Caribbean Literature. Vol.1. Karnak House, London 1987, p.28. “The assets of immigration–the acquisition of new cultural experiences, art forms and attitudes–have so far been only minimally recognised, and far less encouraged. If they were, Britain would gain a far richer cultural scene, and would moreover be giving minorities their due. Unless that happens, there is no justification for calling Britain a multi-cultural society.” – Naseem Khan, The Arts Britain Ignores: The Arts of Ethnic Minorities in Britain. London, Arts Council of Great Britain 1976. Benjamin, Ione (1995), The Black Press in Britain. London: Trentham Books. Broughton, Simon et al, eds. (1994), World Music, The Rough Guide. London: The Rough Guides. Deneslow, Robin (1989), When the Music’s Over: The Story of Political Pop. London: Faber and Faber. Harriott, Jacqueline (1992), Black Women in Britain. B.T.Batsford, London. Polhemus, Ted (1994), Street Style: From Sidewalk to Catwalk. London: Thames and Hudson.